Ocean ecosystems are constantly subject to various human and environmental pressures—also called drivers—that may have small to large ecological effects. In many cases, we have limited understanding of how different parts of the ecosystem will respond to these drivers. For example, how will a fish population respond to an increase in fishing pressure? Scientists and resource managers often use methods and tools that assume the relationship between a driver and the resulting ecological response is linear; meaning a small change in the driver (e.g., fishing pressure) is assumed to cause an equally small ecological response (e.g., small decline in fish population). However, growing evidence suggests that relationships between drivers and their ecological responses are often nonlinear, meaning that small changes in a driver can create a disproportionately large ecological response. For instance, instead of an incremental increase in fishing pressure causing an incremental decrease in fish abundance, the fish stock might unexpectedly collapse and impact other ecosystem components and processes. Such ecological surprises can have broad and severe ecological, social and economic consequences that may be difficult to reverse. Our team synthesized available literature to provide a comprehensive review of the relationships between drivers and ecosystem components in open ocean ecosystems to 1) identify where and when nonlinear relationships between drivers and ecological responses are likely to occur, and 2) determine whether there are general patterns in how ecosystem components respond to human and climate drivers. Understanding how marine ecosystems respond to human and environmental stressors gives us insights into system dynamics, management targets and tipping points in marine ecosystems. To decrease the potential risk of negative ecological consequences, it is safer for scientists and managers to assume that pelagic ecosystems respond nonlinearly to environmental and human drivers, rather than linearly. Strongly nonlinear ecological responses are often driven by climate and food web variables, but are also associated with local drivers that can be more easily controlled by managers (e.g. overfishing and pollution). Certain driver-response relationships in pelagic marine ecosystems have the potential to exhibit threshold responses, in which there is an abrupt switch in the relationship. Using more robust methods to detect non-linearities and threshold responses in ecosystems will likely uncover further evidence for the widespread presence of nonlinear driver-response relationships. How is this information useful to managers? Understanding when linear and nonlinear responses occur can greatly improve our ability to anticipate future ecosystem conditions and better inform management strategies. Strong nonlinear responses in open ocean systems can indicate potential thresholds or ecological boundaries that may serve as critical reference points to either avoid or target when making decisions. Even when managers cannot directly influence ecosystem change, they can use information about nonlinear and threshold responses to better guide how they manage other drivers of change in the system. 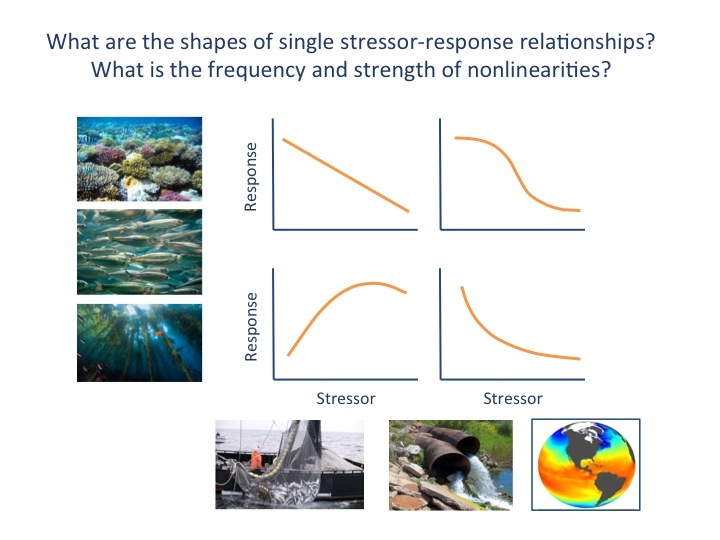 Our study documents a number of ecological contexts where scientists and managers might look for nonlinear driver-response relationships and threshold responses. Considering nonlinear relationships in management decisions, given their prevalence in the marine pelagic environment, is critical for successfully mitigating and adapting to ecosystem change.